Video game maker EA announced today that they will be releasing a sequel to their very popular Star Wars Battlefront game. Whereas the original only included content from the original “Star Wars” trilogy, the new game, to be released in 2017 will include additional characters and locations from newer movies. To date, Star Wars Battlefront has sold 14 million copies, so the bar will be set pretty high for the sequel next year. 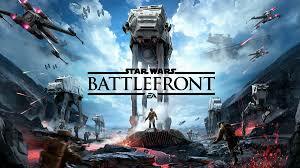 Be the first to comment on "New Star Wars Battlefront Game In the Works for 2017"